The cardinal was adopted as the state bird of Illinois on June 4, 1929 by an act of the Fifty-sixth General Assembly of the State of Illinois. The following information is excerpted from the Illinois Compiled Statutes , Chapter 5, Section 460/10. CHAPTER 5 - GENERAL PROVISIONS. 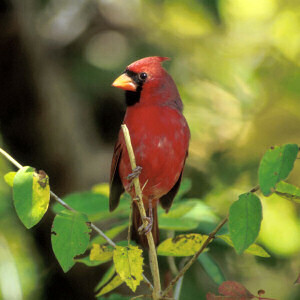 Cardinalis cardinalis (Northern Cardinal): University of Michigan Museum of Zoology: Animal Diversity Web. State Bird List: List of all of the state birds. State Birds & Flowers 1000-pc Puzzle: Created at the request of The National Wildlife Federation this design is a beautiful and informative puzzle featuring every state bird perched on the appropriate state flower. Bird Feeders and Accessories: Backyard Birding > Bird Feeders & Accessories from Amazon.com.